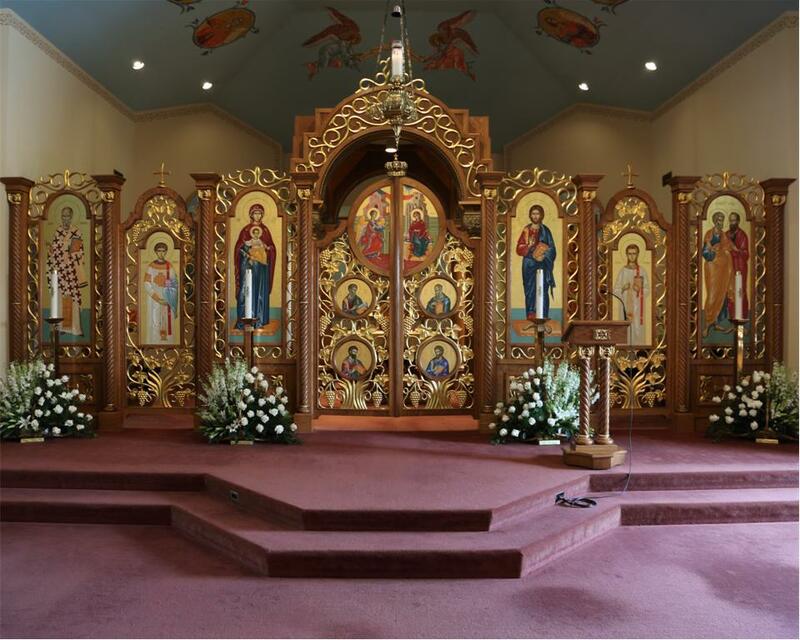 Saints Peter and Paul Byzantine Catholic Church, Bethlehem, PA, began her existence on Edward Street, on the south side of Bethlehem, in 1917. After seventy-four years, overlooking Bethlehem Steel, the population of the parish began to migrate toward the north of Bethlehem and the adjacent townships. In May of 1988, Monsignor Paul Firczak, pastor, recognized the changing demographics of the parish. He purchased thirteen plus acres of prime land located between Macada Road and Johnston Drive, on the north side of Bethlehem with the intent of eventually relocating the parish. Unfortunately, Monsignor Firczak would never gaze upon his dream. He passed away in September of 1988. Saints Peter and Paul Church had a series of interim pastors before a new pastor, Rev. Robert F. Slesinski, was appointed in November, 1990. Upon studying the parish’s demographics, it was determined that it was time to relocate and rebuild. The design of the new church would incorporate many of the existing church’s features. The stained glass windows, chandelier, bells, and more would become part of the new church. Construction began with the ground breaking ceremony on October 1, 1991. 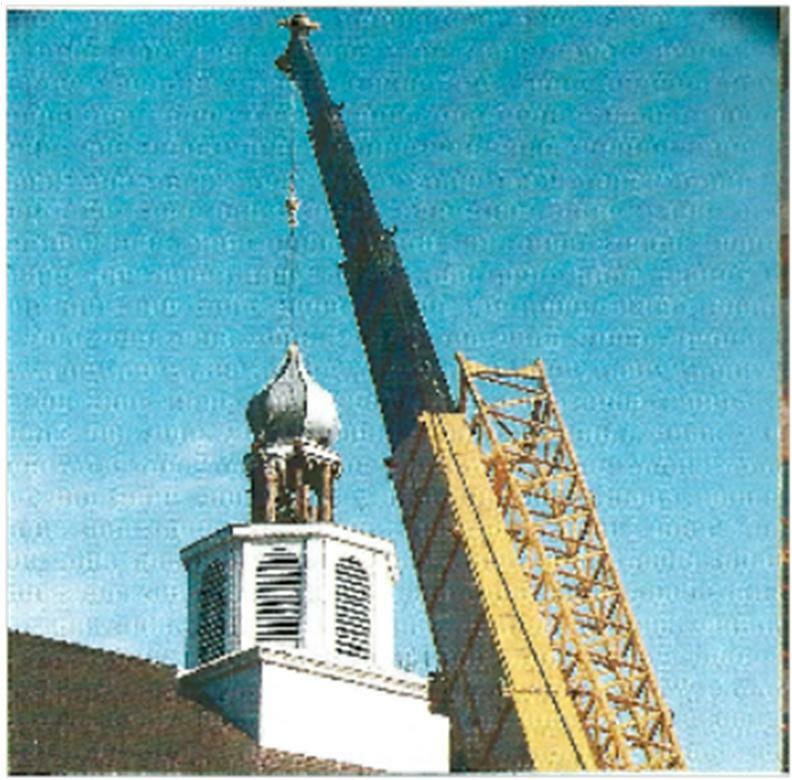 Six months later, on April 16, 1992, the old main dome, which sat faithfully above the bell tower on the church since 1942, was removed to provide access to the bells. Since, the dome was found to be in stable condition, it was then relocated to the site where the new church would eventually be built with the hope that someday it could be used as part of a shrine. 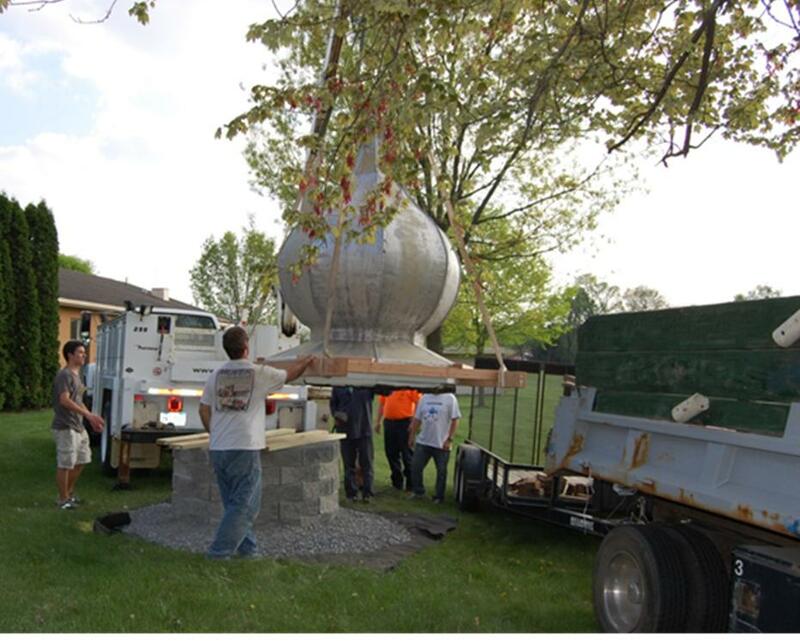 In 2015, altar server Nicholas Chismar, of Boy Scout Troop 362 Bethlehem, PA., noticed the old main dome sitting on the ground in the field behind the church. 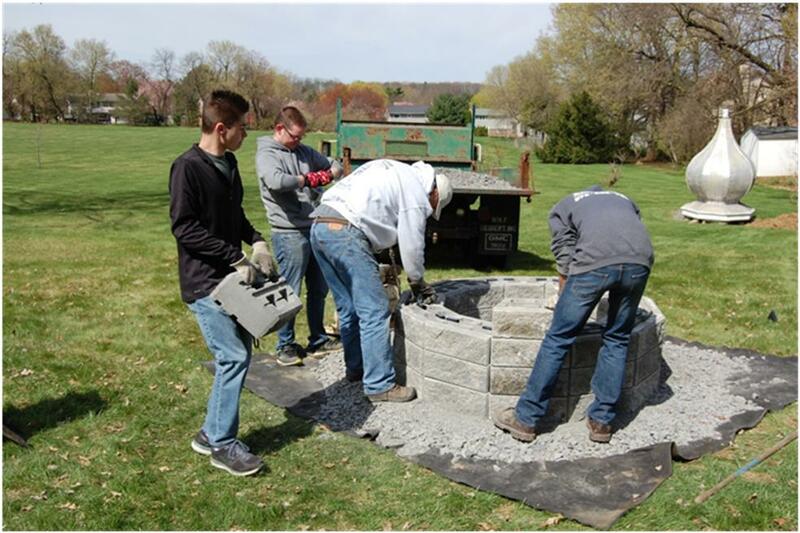 He decided, as part of his Eagle Scout Project, to restore, relocate, and create a shrine blending the history of the old church with the new church. Approaching current pastor, Fr. Peter Hosak, with his idea, the planning process began. After several conceptual meetings, the idea was then presented to his scout leaders. On October 9, 2014, the Eagle Scout Project received approval --- work would begin in the Spring of 2015. The scope of the project would include numerous facets: power-washing the brick walls surrounding the church, landscaping, beautifying and mulching all areas surrounding the church and rectory, and of course providing a new home for the dome. Moving the old dome would be formidable since the weight of the dome was estimated to be between six-hundred and seven-hundred pounds. The location chosen for building the block pedestal to hold the old dome would be approximately one-hundred and fifty feet closer to the church. This relocation would enable the old dome to be highly visible to all who would enter the Church. On April 25, 2015, seventeen volunteers, including scouts and adults, showed up at the church and the project was underway. It would take several days to complete the multi-stage project. The project included using a service truck crane to move the dome into position atop the pedestal. In total, over 220 service hours went into this project. The rank of Eagle Scout was earned by Nicholas on August 13, 2015. 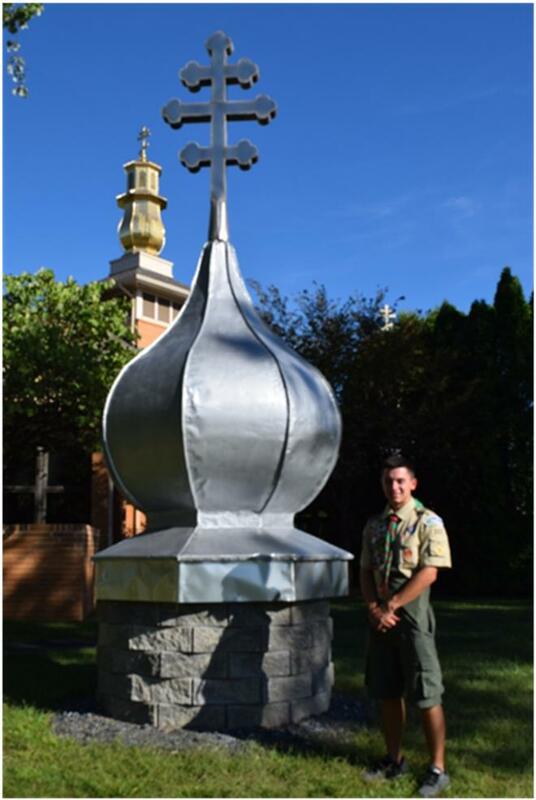 Altar Server and Eagle Scout, Nicholas Chismar, photographed with the completed and restored old church dome, admires his accomplishment. A contrasting, recently gold-leaded church dome can be seen on the new church that sits in the background. After sitting out back behind the new church for 23 years, the old dome finally has a new home. This article further documents the efforts recorded above of our parishioner and Eagle Scout Nicholas Chismar of Boy Scout Troop 362 Bethlehem. To view and read the article click on the article title above.